As NAR’s annual Midyear Meetings are underway this week in Washington, DC, we took a look in the Archives to find out what happened at the Midyear Meetings half a century ago. In 1963, the meetings were held in Chicago in June, where attendees were updated on the progress of the National Association’s first major national advertising campaign. 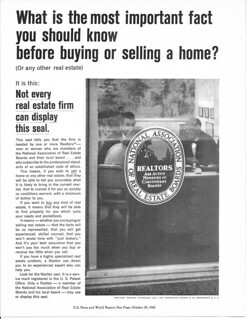 NAR had engaged in national ad campaigns before, notably in conjunction with the federal government’s “Own Your Own Home” initiative in 1919 and another targeting local newspapers in the early 1930s. This campaign, though, was much more closely orchestrated than earlier efforts, seeking to put the REALTOR® trademark before as many public eyes as possible. Full-page ads appeared in publications such as U.S. News & World Report, Look, and Newsweek, all emphasizing the benefits of home ownership and using REALTORS® as professionals in the real estate transaction. Thousands of REALTORS and local associations subscribed to the promotional campaign for $25. In return they received advertising kits that tied in with the campaign. In many of the magazines the names of REALTORS® in that locality were printed on a page adjacent to the ad. Despite the kudos, this was still relatively new territory for NAR. At the 1963 Midyear Meetings the association’s Board of Directors took a tentative view of the campaign, deciding to allow the program to continue on an experimental basis for another year. In 1964 the campaign was granted a longer tenure, continuing through the early 1970s. NAR’s efforts to promote the benefits of using a REALTOR® have come a long way since 1963, of course. Visit the Public Advocacy Campaign for a look at the latest national advertising efforts.